Many of us desire the kind of friends who would stand by us when we are down in the drains, when we go through hardships, when we are financially broken, when we need a helping hand or even to show sympathy and say a word of solace. But how many times have we also had this thought – “Be there when I’m in the ditches, but would you also be there when I’m on the mountains?” We always have the camaraderie of togetherness through storms – when we need it the most. But do we also count on the same people during the successful periods of our lives? When asked this, many would go back to the age old saying of “A friend in need is a friend indeed”. Friendship is a special bond or connection you share with another fellow being where there are natural expectations of having the person in the joys and sorrows of one’s life. Hence, it is not only in times of need that one expects his friend’s presence but also while sharing the happy moments that make up their lives. It is easy to lend an ear or a shoulder, say two words to console, be there to show your presence, or even go an extra mile to prove your relationship. But it takes a fine nature and a mature friendship to be available during the success of their friends. We often feel uncomfortable in telling many of our pals about our promotion or perks in the job or winning an appreciation or even getting a much wanted seat in a college. The relationship should give oneself the freedom and comfort to an extent where the first person they think in their mind to share the news with is that particular friend. 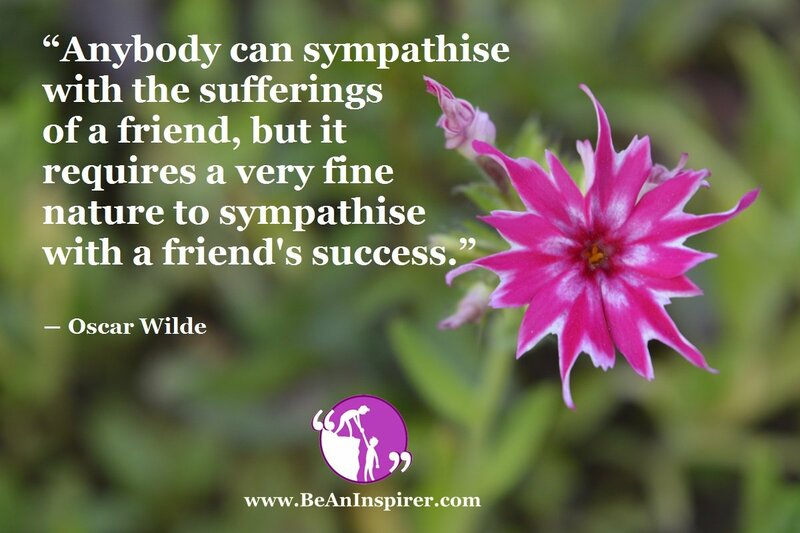 It takes a noble personality to be selfless and share the joy of a friend’s success. One has to forget about whatever situation they are in, be it higher or lower in status than the friend, when a good news is shared. How selflessly and genuinely do we accept their achievement? It all finally boils down to the value we give to that relationship. Being humans, it is natural to have expectations from another but are we realistic in having those expectations? How practical are those expectations? Does our friendship make us have the expectation that our friend will be with us even during our successful times? The word literally means unconditional love or the highest form of love. Any relationship would have their ups and downs. But the relationship truly flourishes if they have unconditional love as their foundation. Friends know that whatever chaos their friendship goes through, if they have that love between them eventually, no matter what wreckage happens, they will bounce back to the strong bond they share. Having this foundational love would automatically bring in a sincere happiness in a friend’s triumph. Altruism in its literal sense means helping someone without expecting anything in return. This reminds us of the famous personality, Mother Teresa, who offered both, the togetherness through storms and calms of life for those who were shunned by the society. That friendship she showed can be pointed out as the epitome of a relationship a person can have in life. All the above mentioned qualities can aid strong and valued friendships between human beings. At the end of the day, whatever situations they endure or whatever life throws at them, people should be able to bank on the togetherness through storms and calms of life that friends provide. A Friend Is One Who Is Always By Your Side And Believes In Giving You Happiness; Own The Friendship Treasure You Have Received For Lifetime As Once It’s Broken, It Can Never Be Mended! !